Thanks or the great trip report and photos. It is great to see a verry different sort of coastline to what I am used to. Like Slaughter said: One day. Except that the more I read about interesting places, my "One Day" list is getting longer and longer. We'll keep the light on for you and have a boat all warmed up for your arrival. Winds are predicted to be too weak for a couple 20 mi days on this planned trip. Stay tuned. I hope to re-schedule for Feb 4-10 or Feb 18-24. 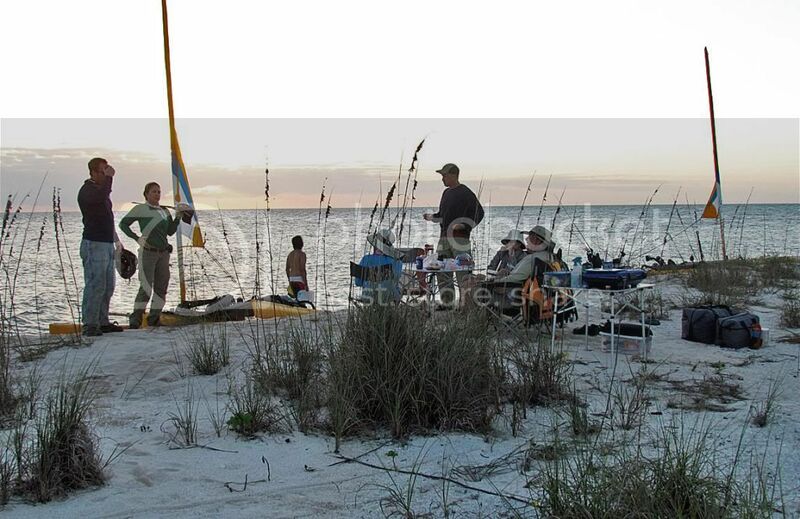 In lieu of this trip, we are doing a 4-day trip (Mon-Thu, Jan 14-17) from Flamingo to Mid Cape Sable. Launch at 10 am, Monday, Jan 14. I'm not sure if this post belongs here or not, but here is a post with a video of me taking an Adventure Island into Algonquin Park in Canada. Since I built my first hakas, and they came in at 14# each, I've been thinking about how to use them on camping trips and how to reduce my load for camping trips. A common mistake that most of us have made a time or two is to take too much stuff. I've done it several times but lately I am much better and have a reasonable load. Krugers and class 4 boats can carry a lot of stuff. If you are new and this is your first EC or UM, try to think like a backpacker. 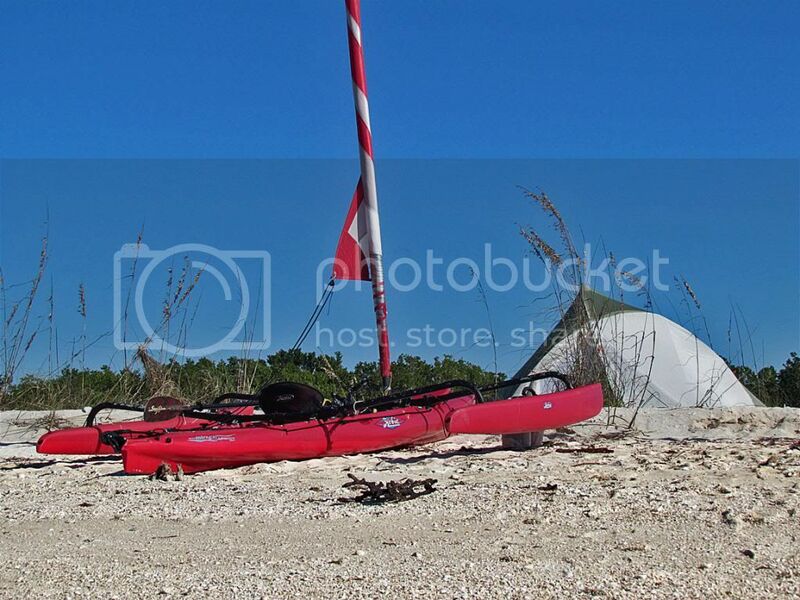 Start out with three piles of stuff: Boat Stuff, Camping Stuff, Food and Hydration. Boat Stuff would include bailers, paddles, self rescue, repair kit, nav lights, charts, lifejacket properly configured, etc. Anything that must be on or with your boat consistent with prudent seamanship goes in this pile. Pair it down relentlessly but keep the stuff you really need. Camping Stuff should fit in a smallish backpack. I'm talking a 3-day backpack. If all your camping stuff weighs more than 15 pounds, you're probably carrying too much. Some really ultra light guys can get it down to 10 pounds. Food and hydration is really tough. Most carry too much. Remember that you can resupply at all checkpoints, but that will cost you time. Strike a balance. So carry what you need, but don't let it get out of control. Chief and most WaterTribe participants are more extreme than I will be. Still, they are doing a grueling 7-8 day competitive racing, camp trip, and they need to get it right or they will quit. What has struck me about people using a Tandem AI is the amount of stuff they bring camping. Wow! (And, they still sail faster than I do.) The problem with bringing a lot of stuff is, well..., it is a lot of stuff. That means longer packing up, heavier load to slow you down, and more to clean up when you get home. I have often said that "backpackers have it right" when it comes to camping. But, as I said, I am comfort driven; I'm not a minimalist. The hakas are going to help a lot. Many things which have previously have gone in the hull can now go on the hakas--camp chair, tent/poles/stakes/mallet, inflatable mattress and pillow, Dromedary bags of water. 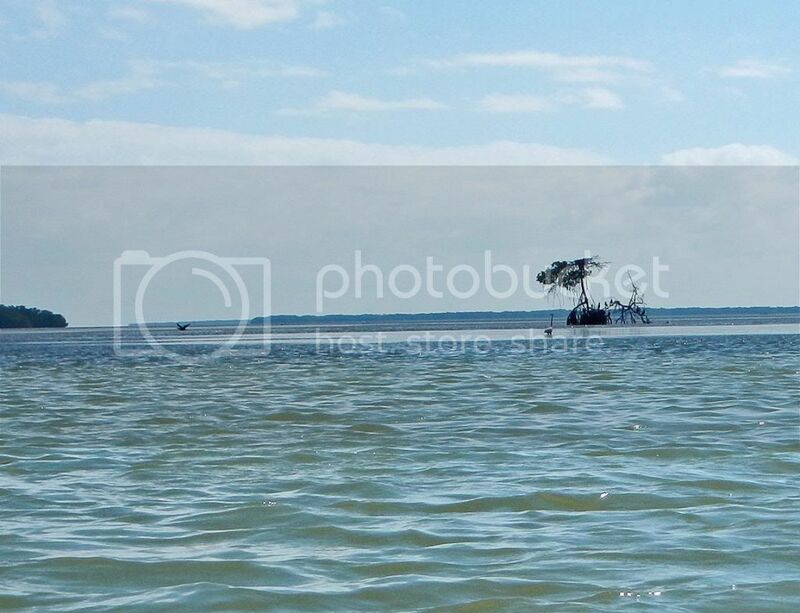 The water can be distributed to keep the boat more level and faster. The hull will float higher, leak less, thereby keeping the weight down. Thank God for hakas! No. Thank NOHUHU for hakas! Last edited by Chekika on Mon Jun 24, 2013 6:55 am, edited 1 time in total. Anxious to hear how they work out. Hakas could certainly make the trip drier and more comfortable while sailing. They're multi functional for camping as well. 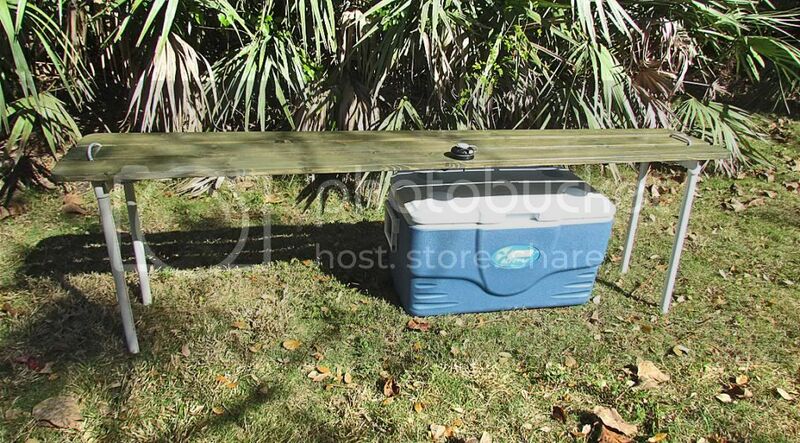 Add some lightweight folding or expandable legs and you have a quick-setup bench and table, gator-fence, etc. I would think thar during a brutal week long endurance event, ergonomics on and off the boat can make quite a difference in your comfort and stamina. And save a padded spot on each Haka for your Okole. 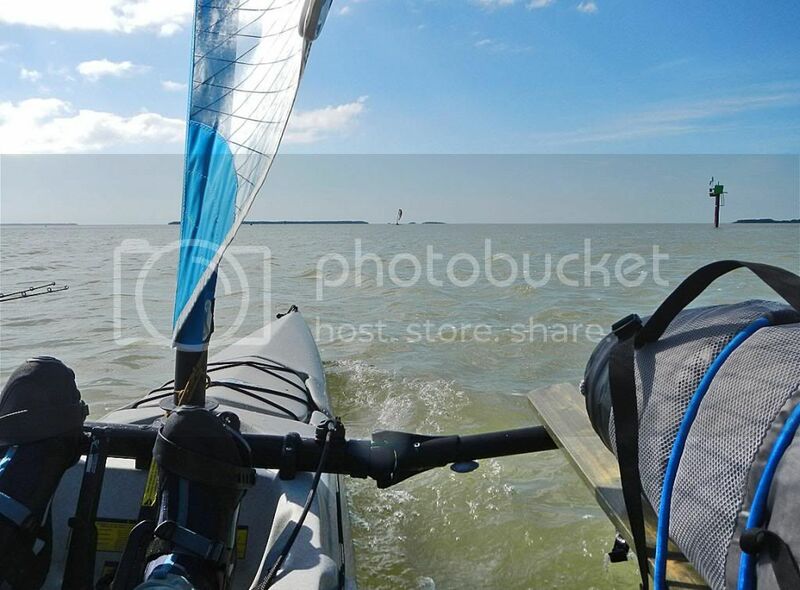 When the wind is up and the saling's wet you're really going to enjoy hiking out for a change. Mahalo for your kind words, and great advice - and good luck! 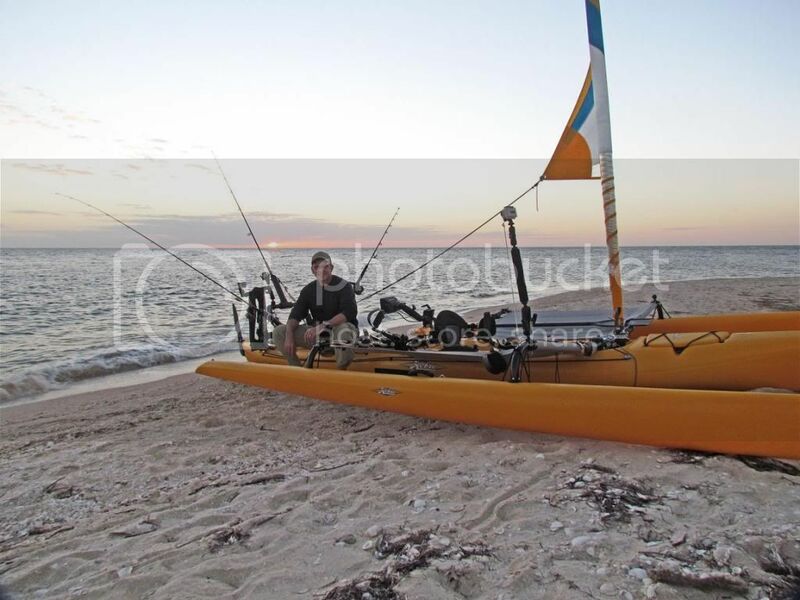 I agee Keith, NoHUHU has completely changed AI sailing for many of us by introducing the hakas. Once you use them there's no turning back. Especially if you do expeditions. I'm glad you finally made yourself a set. And true it's good to get as much lot into your hull but it sure is nice to have a dry bag with extra warm gear or food safely strapped to a relatively dry haka. I can see in 10 or 20 years the post office coming out with a stamp with NOHUHU's picture on it commemorating the AI Haka pioneer. I'm sorry - does one need to be DEAD to have a stamp made of you? In that case, I nominate Batman for the stamp. This describes the construction of my second pair of hakas. I constructed 2 pairs in the last 6 weeks. Hakas have great potential for camping trips. They can carry items that have regularly been stored in the hull, e.g., camp chairs, tent/poles/stakes, tarp/poles, Dromedary water containers, a dry set of clothes—all in dry bags as necessary. Loading the hakas should be done with an eye to keeping the boat level. A haka can even be used as a camp table. On the negative side, the hakas add their weight to your load. Therefore, having a set of light-weight hakas is desirable. My goal in the design and construction of this pair of 3-board hakas was to keep the weight down. The weight was reduced by using all aluminum framing to fasten the three 6’x1”x4” boards together. Stainless steel screws/bolts were also used. When finished, the hakas weighed 22# (10 kg) total. Surprisingly, the materials cost for my 2 sets of hakas was almost the same. On the other hand, without doubt, this method of construction is easier than that of my originals. The link to my original haka construction: viewtopic.php?f=69&t=37645&p=200342#p200342 These hakas are not as strong as my originals, but each of these hakas will support my weight (200#) on center when used as a bench. Finally, since no glue was used in this construction, the hakas can be easily be disassembled for repairs and/or re-varnishing. 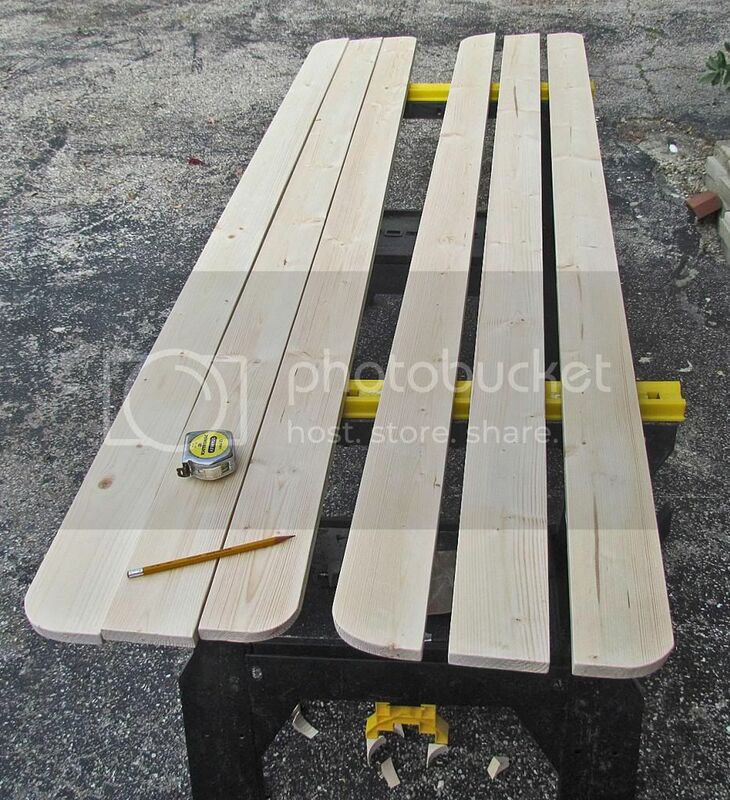 •	6 regular pine (whitewood) 6’x1”x4” boards. Go to Home Depot for these. •	120 Grit sandpaper	4. •	1 qt McClosky Marine Spar Varnish	28. •	1 pt Bottle turpentine	5. •	1 pt Bottle paint thinner	6. •	4 Boxes of 25 each of SS pan head screws, #10 x 3/4”	27. •	2 Boxes of 50 each SS pan head screws, #6 x ½”	14. •	100 #10 nylon washers	6. •	12 eye pads 5. •	Bungee cord clip	3. Regarding cost, I have enough varnish, stain, 1.5”x1/16” aluminum angle, paint thinner, paint brush, and hand sander to build another set. So, the real cost of materials for 1 set of hakas is closer to $160. To realize this saving, you would have to have a buddy build a set & share these materials. 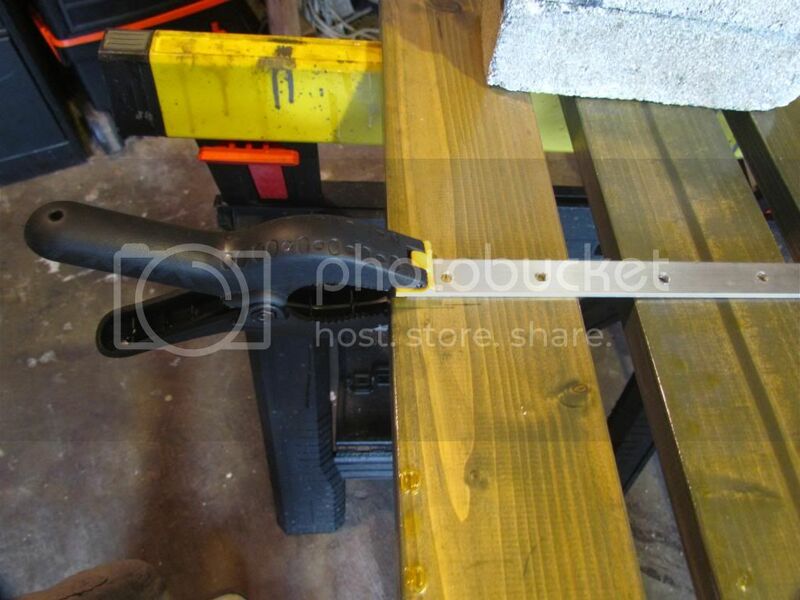 •	2 Saw horses—Stanley 32” adjustable sawhorses are great. •	Hand clamps, bag of 8 of different sizes—these are definitely useful and they are cheap. •	16”x24” framing square—I used 2 of these. Building these hakas is straight-forward. Here is a schematic of the underside of a haka. Day 6	Assemble a haka. Be sure the sawhorses are absolutely level. Use the Irwin Bar clamps to clamp 3 haka boards in position. At each end, separate the 3 boards with spacers (the 1” square dowel cut in 2” lengths.) Use the large framing square to make sure everything is square—that is, the ends are at a right angle to the sides of the boards. Attach the 1.5”x1/16” aluminum angle at each end using the #10x3/4” SS screws. Pre-drill each screw hole and add a drop or 2 of silicone goop to each drilled hole before setting the screw. 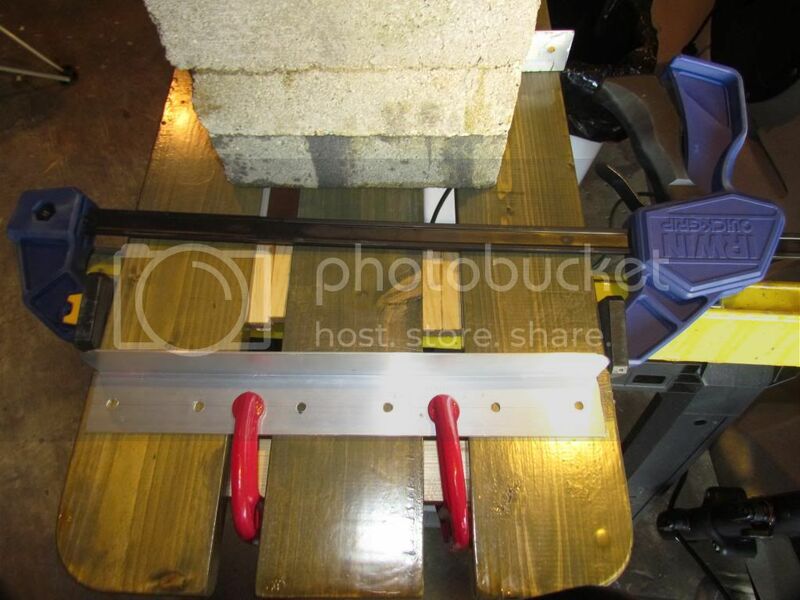 View showing an aluminum angle (1.5”x1/16”) clamped and ready to fasten with SS screws. Then, attach the 3 aluminum cross bars with six #10x¾” pan head screws. Pre-drill each screw hole and add a drop or 2 of silicone goop to each drilled hole before setting the screw. Remove the spacers. View showing a hand clamp holding an aluminum bar. It is ready to fasten with SS screws. Now, there are just a few more items. (1) Attach the permanent bungee cord to fasten the hakas to the akas. 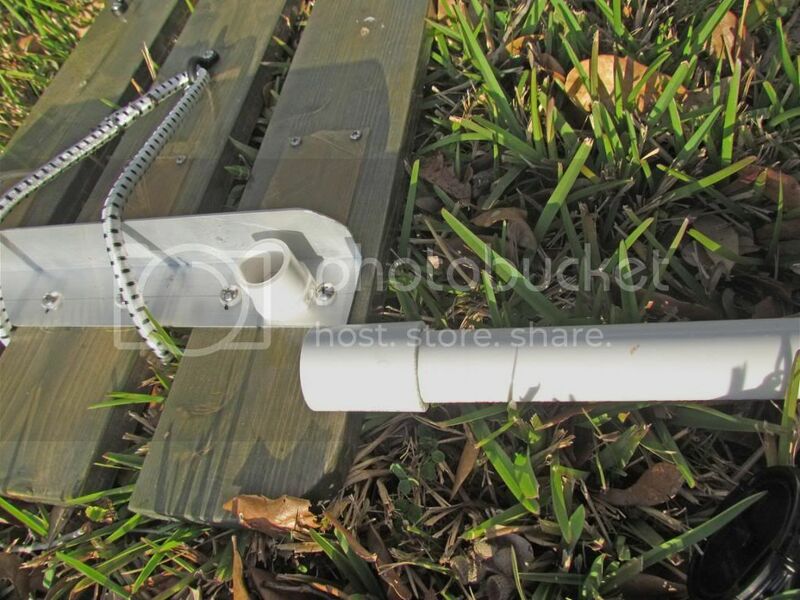 (2) Attach the stiffening brace—use ¼” bolts & nylon lock nuts. Use nylon flat washers to isolate steel bolts from aluminum brace. (3) Add 6 pad eyes for attachment of bungee cords. (4) Attach 6 protective bumpers (heavy plastic or rubber strips) under each haka to protect the aka. Use the #6x½” pan head screws. Top view of one haka. Paddle cozy was attached to one haka. RailBlaza Starports were attached to each haka. Warning: the bungee loop, as shown in this picture of the table, is too loose. To secure the haka to the aka, loop the bungee over 2 (two) of boards. 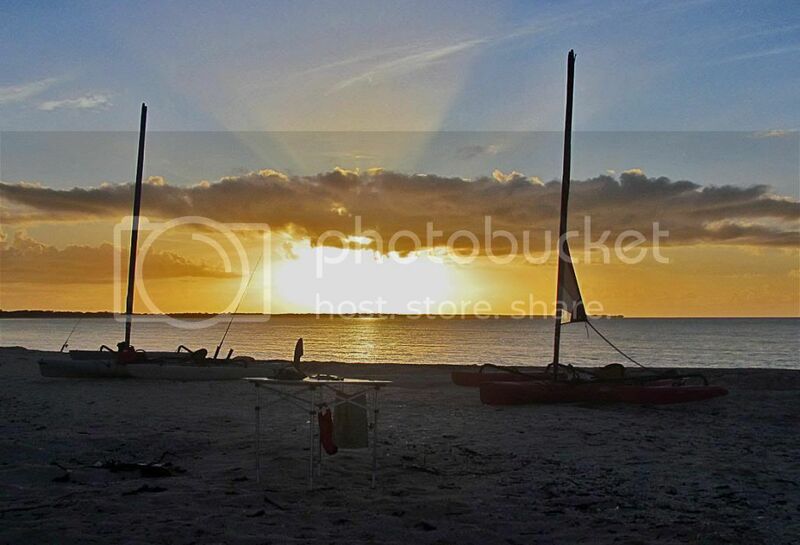 Last edited by Chekika on Tue Feb 11, 2014 6:19 am, edited 2 times in total. How do your table legs attach to the hakas? I had mine as a table once and it sure came in handy. The one downside of using pvc was the table is a bit wobbly and you have to be careful using it. 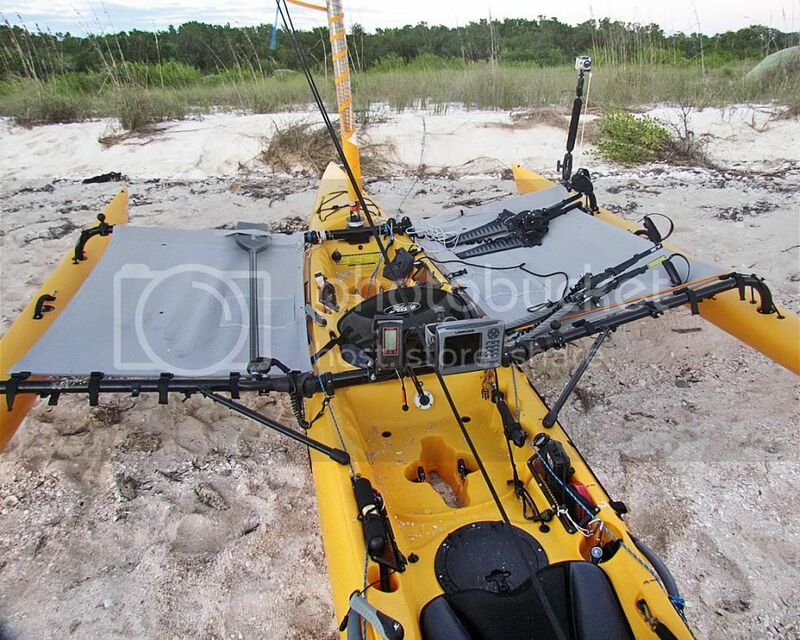 There's a lot of surface for preparing meals and keeping gear out of the sand. 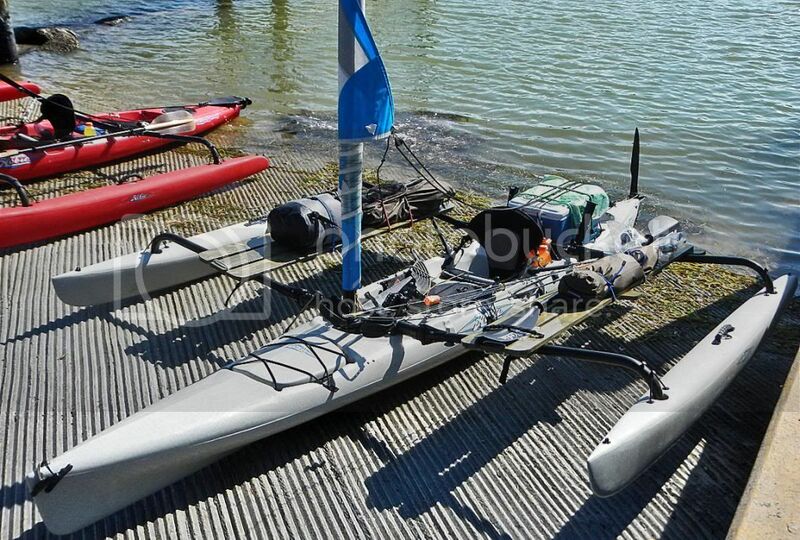 One suggestion is you could remount that paddle cozy to the outside of one of your front akas. I did that recently. And then add a leash to the paddle and clip it to an outer padeye on the haka. That way you don't have the paddle taking up haka real estate. It might be harder on your setup with the padeyes under the haka though. 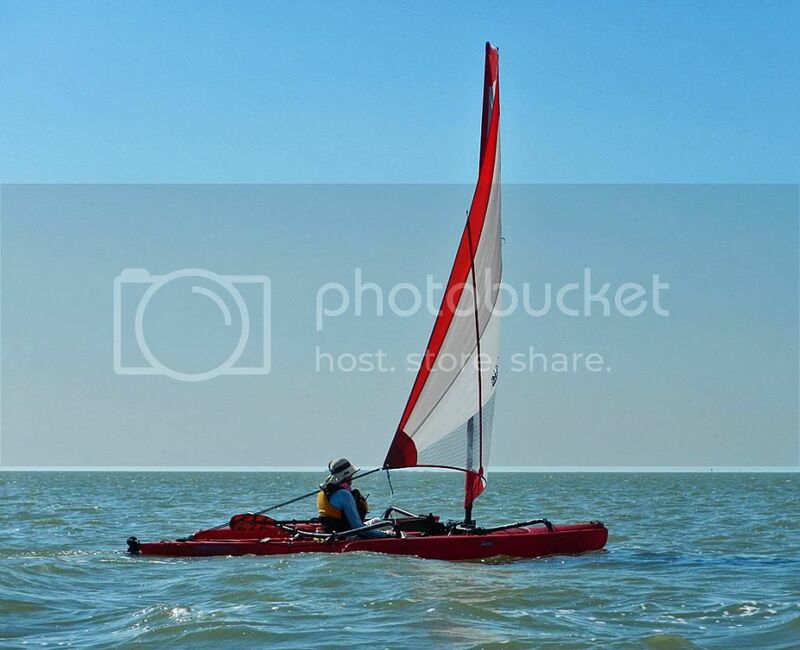 I can still reach my paddle easily and even leave the leash on it while I use the paddle to move the mainsail shape on a downwind. It's always available. The other day I cracked one of my aluminum under braces and replaced it. One of my boards is cracked too. Too many excellent home cooked meals from the wife no doubt. Good ideas, Jim. While these hakas support my weight in the center, I'm not going to push it. I put that paddle on w/o much thought. It could be moved to the side easily. 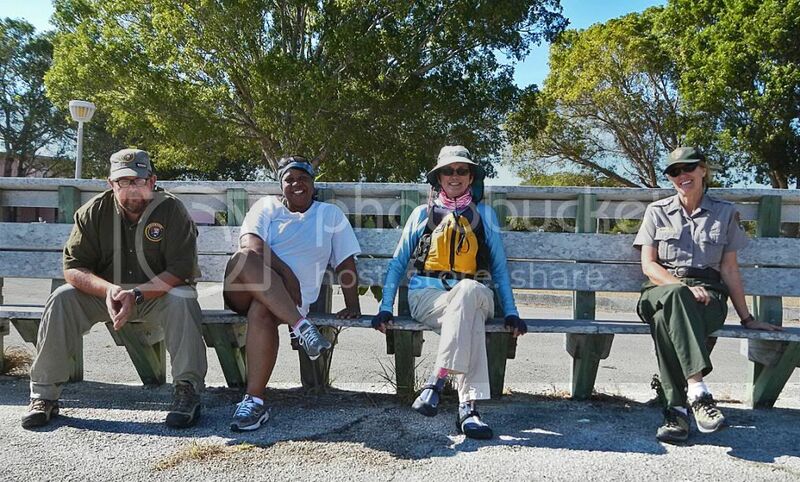 Of course, I haven't really gotten into hiking out yet, although I have sat on them a couple times while underway. Regarding the table legs, when they were 26", the table was wobbly. I cut them down to 21" and it is surprisingly steady. I attached the legs via a flat head cap fastened by a #12 screw on the aluminum angle. The aluminum angle gives the cap a more solid base than attaching directly to the wood. A coupler attached the leg to the cap. I used 3/4" pvc. I think it is going to be a winner. And, I did get the idea from your table. Thanks. 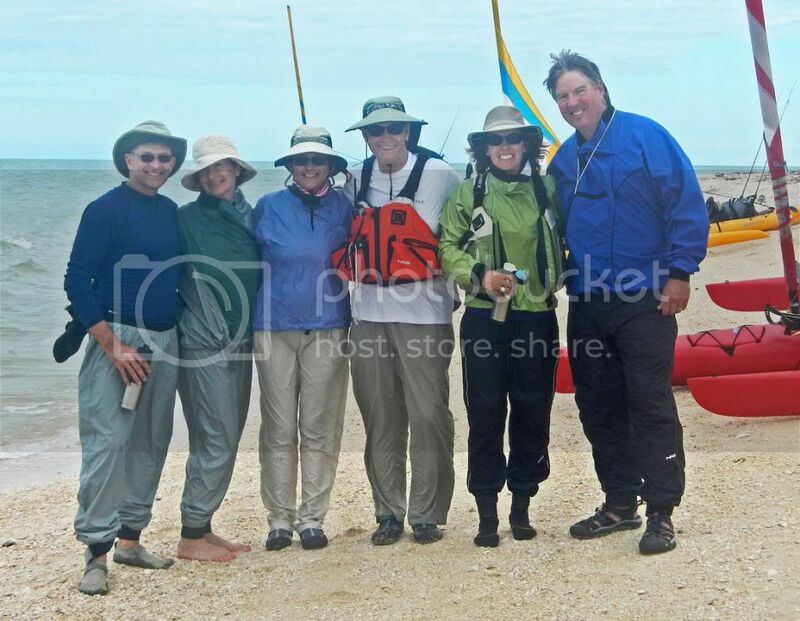 The dates are firm for the Chokoloskee to Pavilion Key trip: Mar 5-8, 2013. 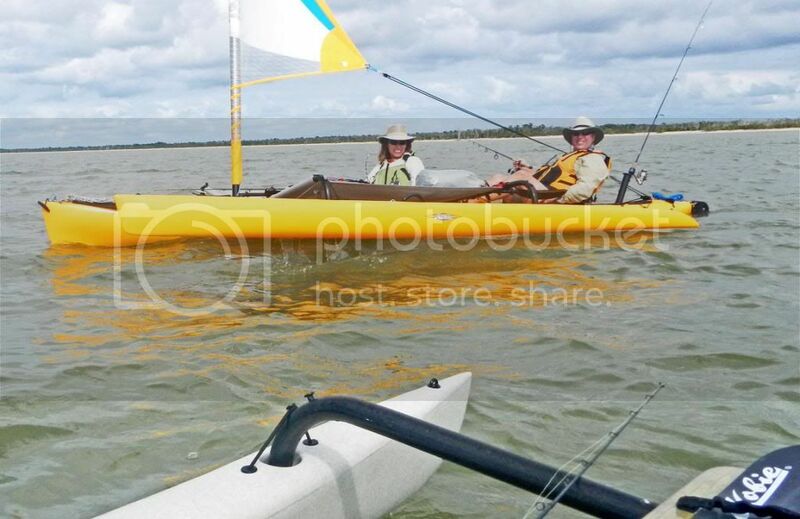 This is the social event of the year in Everglades National Park (for Hobie AIs & tandems, anyway.) 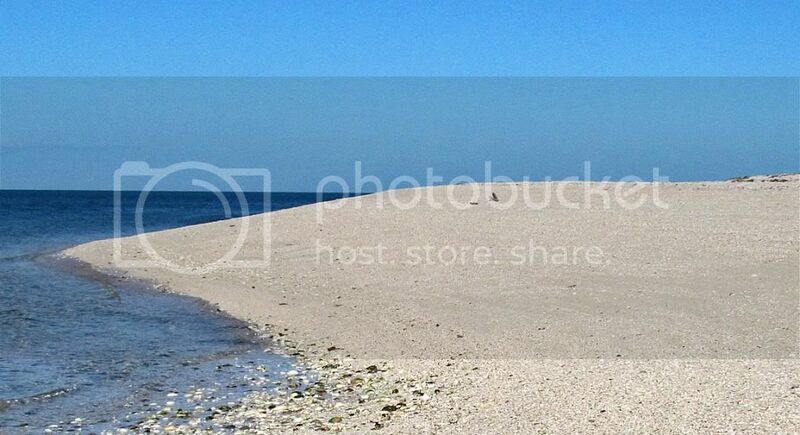 As many of you know, Pavilion Key is a beautiful key in Everglades National Park with a 1 mile, west-facing beach. Lots of opportunity to walk the beach, take pictures, swim to cool off, and fish. It is in March and the fishing should be picking up. 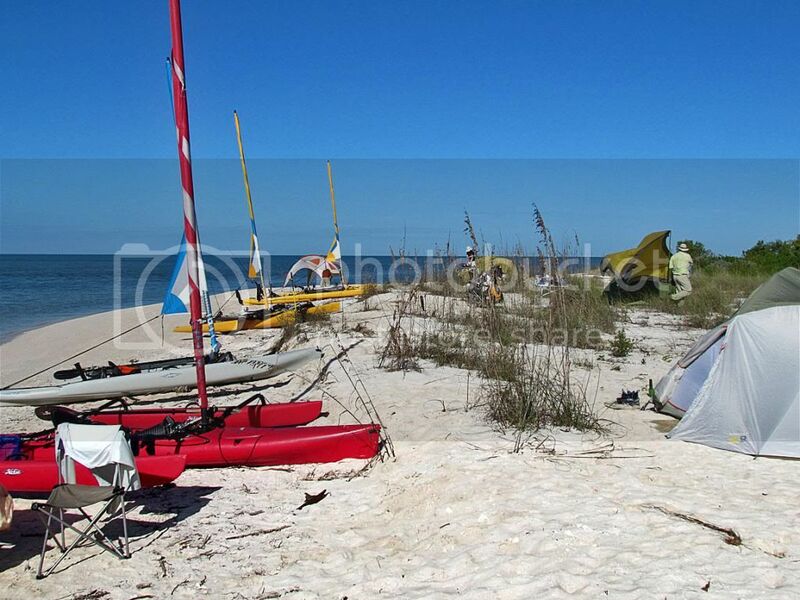 In addition, the WaterTribe 2013 Everglades Challenge will have started at Ft Desoto near St Pete on Saturday, Mar 2, and many of the competitors will be traveling along the coast while we are on Pavilion. All competitors are required to check-in to Check Point #2 in Chokoloskee. Currently, Tom & Debbie Turner and Steve & Maria Sanders are planning to do the trip. Terry Wilson is considering using Nancy’s Adventure Island for the trip. Terry has never sailed an AI, so it would be a first for her. 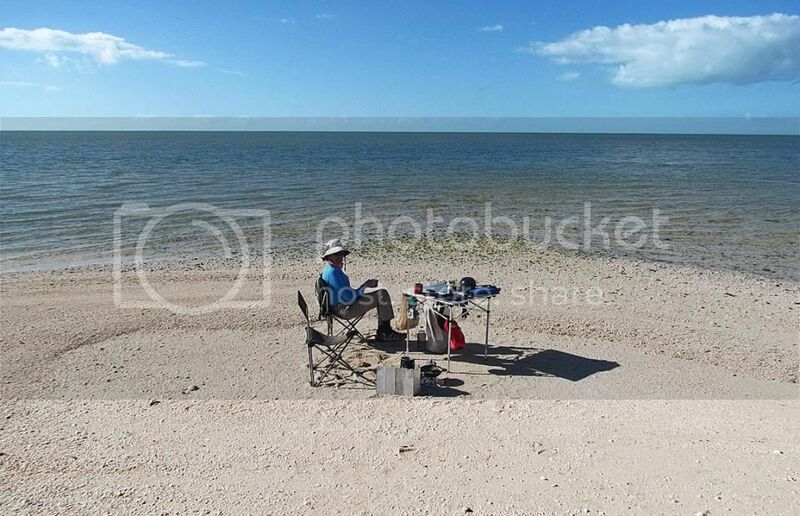 Terry is an intrepid fisherwoman who is very familiar with the waters around Chokoloskee. Ted Jean, former AI owner, but now a Sea Pearl aficionado, says he is coming out on the 6, 7, & 8th. Claims he intends to get some fishing instruction. Maybe when he sees all the AI/TIs, he will flip again. 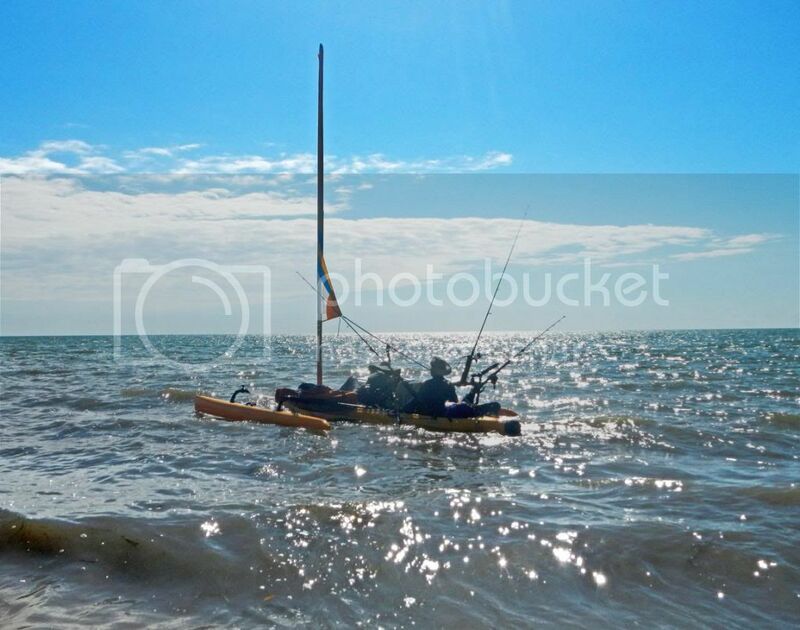 The tides are favorable for a comfortable launch in Chokoloskee and subsequent return. The launch time is 11 am, Mar 5. The return about 1 pm, Mar 8. Let me know if you will be joining us. Cape Sable is an area that had cattle operations and an air strip before it became part of the Everglades National Park in 1947. Other than a few palm trees, little sign of the early human endeavors exist today. Instead, it is a wilderness area harboring a huge variety of birds, raccoons, bobcats, deer, alligators, crocodiles, probably bears and maybe panthers. Large eastern diamondback rattle snakes are found in the area, and, probably, Burmese pythons. When you are on the water, sharks are everywhere. Yet, this wilderness site is only about 60-70 miles from a metropolitan area of 5 million people. We are blessed, really, to have a place like the Park. Nancy and I launched from Flamingo a day before the rest of our group. Here we have the onlookers: Dave, Tina, and Sharon. Nancy is in the middle. Dave is a Park volunteer who lives on his boat in the marina. Tina is married to a ranger. Ranger Sharon recently purchased an AI, which she keeps at Flamingo. This was an important day for me—I am trying out my new hakas, and they were loaded. Nancy and I are headed south out of the marina. 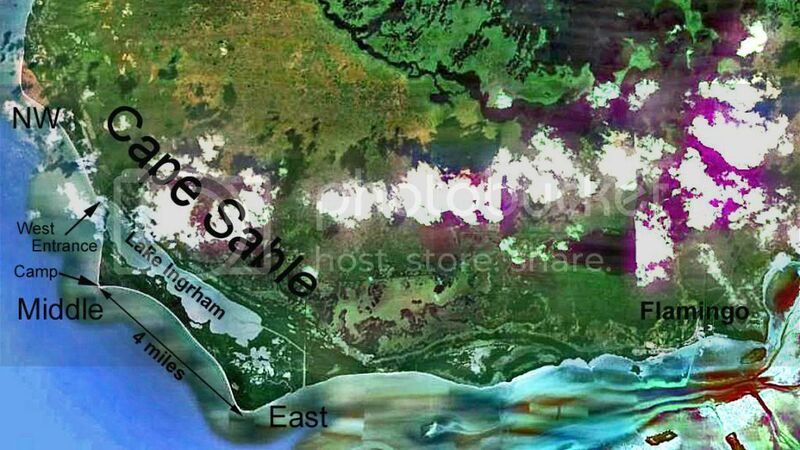 About a mile south, we will enter the main channel and head west to Cape Sable. Nancy underway heading west. It took 4 hours to do the 16 mi to Middle Cape. Nancy enjoying breakfast on the sea shore. It costs $2/night to camp in ENP, and you have sea shore accommodations. I am continually amazed at how quickly the shore can change. In this picture, there are a couple of branch tips sticking out of the sand, just to the right of center in the picture. 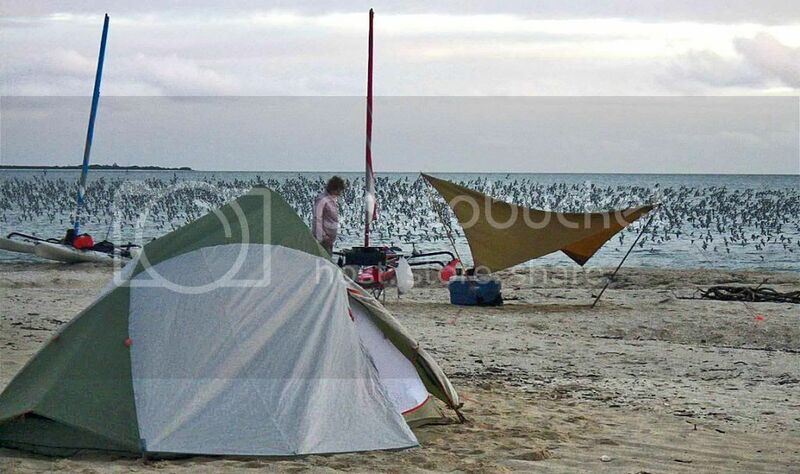 We camped here three weeks ago, and there was no sand around those branches—they were clean down to the sea level. In other words, this huge, 3-4 ft deep sand bank was not here 3 weeks ago. Early morning sun at Middle Cape—view toward East Cape. 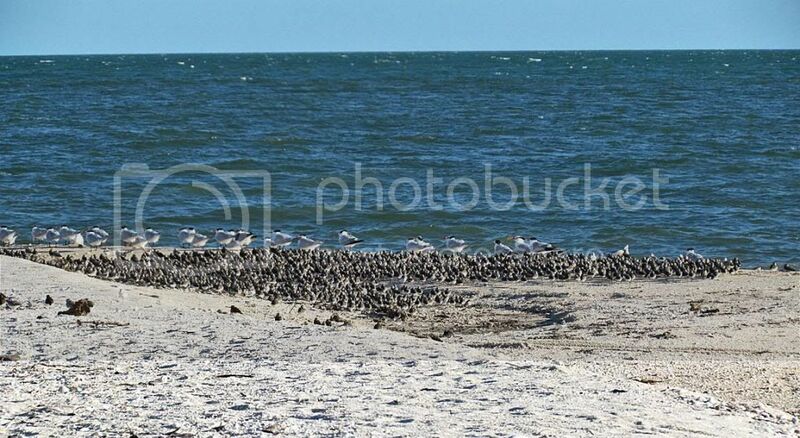 There are huge flocks of birds on Mid Cape. For whatever reason they take flight regularly, circle over the water, and return to the beach. On Day 2, our camping partners arrived. Fishing is a goal of these trips. Here are Debbie and Tom Turner near the west entrance to Lake Ingraham. 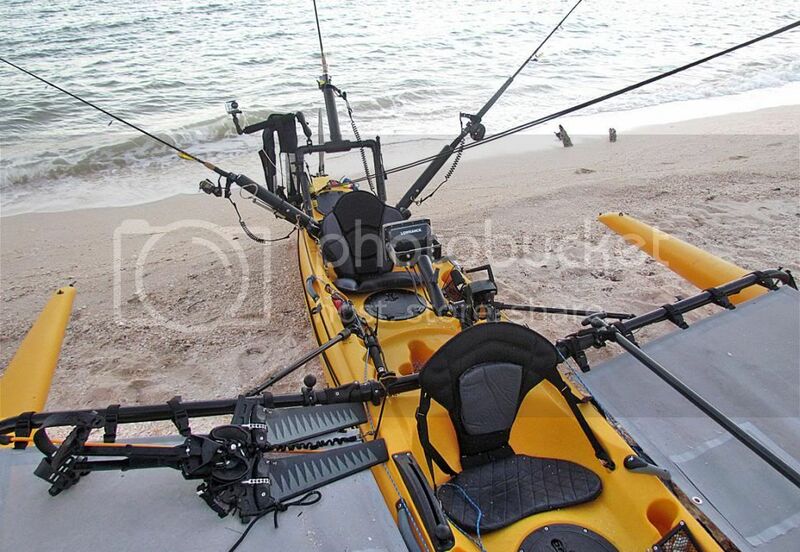 Steve Sanders on his tandem—he has made it into a real fishing machine which he uses for deep sea fishing off the southeast coast of Florida. In addition to his 3 sturdy rod holders on the rear, he has a GoPro camera mounted. On the front half of the boat, he has another GoPro—not going to miss any action on this boat—as well as a fish finder and a GPS. Steve caught a nice snook for release. 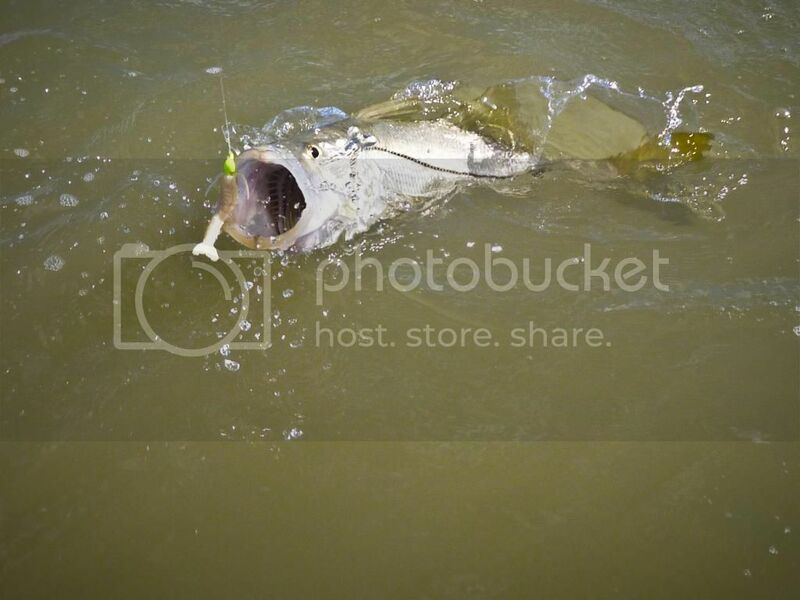 Snook are one of the best eating fish, but they are still fully protected after they suffered a major kill during a hard cold spell 3 years ago. Fishing was slow on this trip. 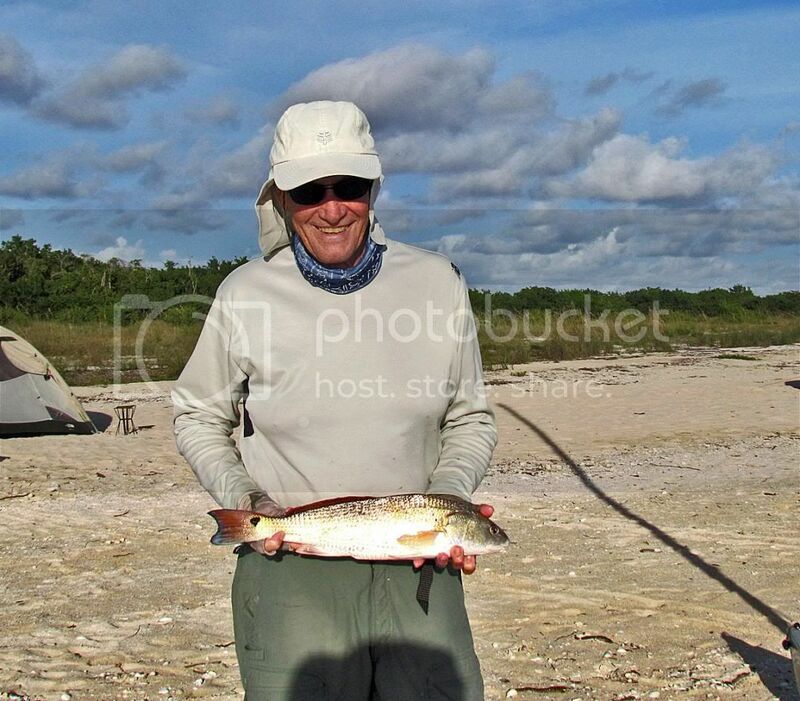 Here I hold an unlucky redfish caught in the area a few weeks before. Sundown visit by 4 young Park workers. Their job is to destroy an invasive non-native plant, the Brazilian Pepper Tree. Over a million acres in S FL are infected. Still, the Park Service has a plan for controlling the tree. These workers are part of the plan. 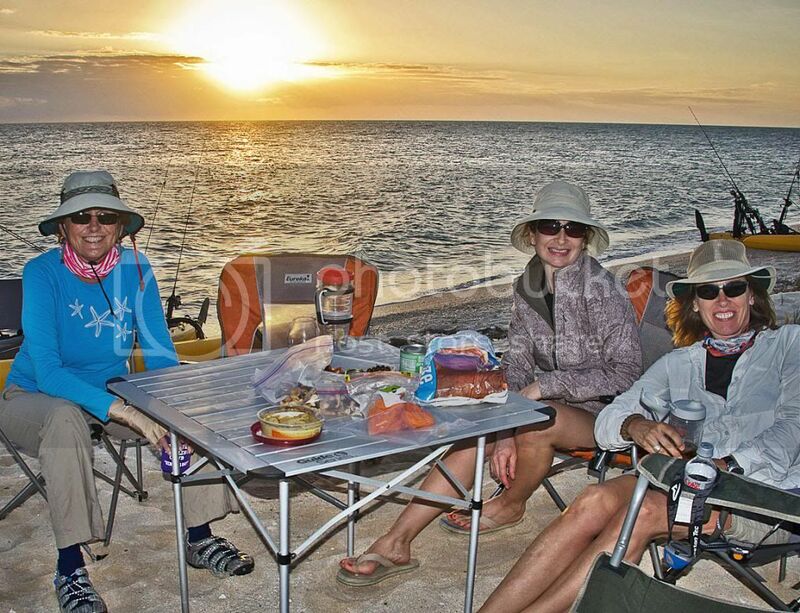 Steve got this picture of Nancy, Maria Sanders, and Debbie enjoying the evening on the beach. 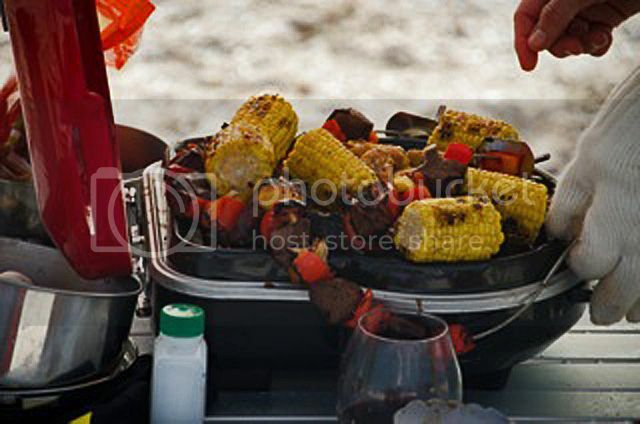 Maria did a great BBQ for Steve. They had so much food, that they invited Nancy and me to join them. A passing raccoon offered to take our picture just before our return to Flamingo: Steve, Maria, Nancy, the author, Debbie, & Tom. Maria & Steve launch their tandem for the 15 mi trip. For Steve & Maria and Tom & Debbie this was their first tandem camping trip. They did great.